EDIT: The How to play FreeCell page of the Solitaire Whizz documentation now contains a screenshot of the original 1978 FreeCell game. There is also a screenshot of the main menu screen in the site's solitaire FAQ. Practically all of the solitaire games commonly played on computer, including the omnipresent Klondike, started life as a traditional card game. But one notorious solitaire game, Freecell, has a curious facet to its history: to all intents and purposes, it actually started life as a computer game. Freecell essentially started life as a game for the PLATO computer, a mainframe system developed for education in the US in the 1970s. The original PLATO version was developed by medical student Paul Alfille and was apparently popular among US university students at the time. In an interview, Alfille discusses how Freecell was loosely based on recollections of other solitaire games he had read about as a child, but not formally based on any prior description of an identical game, and originally played as a card game only by himself. So essentially, the incarnation of Freecell was as a computer game. Various games that were popular in the 1980s, such as Elite, Battle Zone and simple RPGs, appear to have had their origins in games developed for PLATO in the 1970s (the original 1970s games appear to have been slightly more educationally oriented with less of an arcade style to their gameplay: see this video for examples of some games in action). It is probably not too surprising that games played by computing students of the 1970s had spin-offs in commercial games in the 1980s as the respective programmers developed their careers. And so, Freecell as it appeared in Windows appears to have been a spin-off of the PLATO version of Freecell-- even though the Microsoft developers had no connection as such with Paul Alfille. The original PLATO version of Freecell appears to have been highly configurable, with varying numbers of columns and cells. 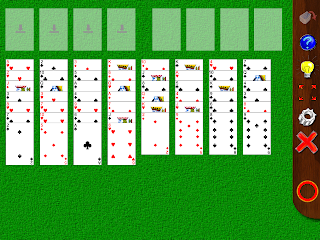 Following its Windows incarnation, modern versions of Freecell tend to be played, as with the version included in Solitaire Whizz, with eight columns and four cells. But Alfille describes another popular variant at the time, with four columns and ten cells, which was frequently winnable. Another feature of the original version appears to have been that it made moves automatically: specifically, when there was only one possible 'useful' move at a given time, the computer would make it automatically. In the Solitaire Whizz version, moves are not made automatically. However, when you press the 'Hint' button (or turn on automatic hints), only 'useful' moves are presented to you. If there is sufficient interest, I may add an option to make moves automatically in a future update to the app. Yes, it was configurable. There were tables of streaks recorded for each configuration. Some people really liked challenge. Others didn't. There were no hints available when you got stuck. The Microsoft version is cheatable: if you get to a point in a game where you can't win, you can reboot your PC (or whatever, haven't tried it with tablets) and the game is erased from history without reflecting on your streak. If that happened in the original version, it was chalked up as a loss. There really weren't that many power outages associated with PLATO so it didn't really impact the player significantly.